Jonas Short Mound, a Middle Woodland burial mound located on the Angelina River under what is today Sam Rayburn Reservoir in San Augustine County, Texas. The mound was 29 meters (94 feet) in diameter and 2.4 meters high (almost 8 feet) and was built over the cremated remains of at least two individuals placed into a shallow pit. In this photo archeologists are just beginning work (an old looter's trench is visible near the center of the mound). TARL archives. 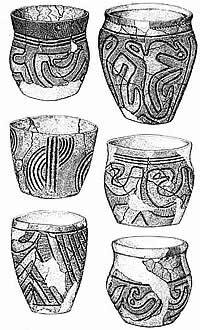 Middle Woodland Marksville Stamped pottery vessels from Crooks Mound, La Salle Parish, Louisiana. From Ford and Willey, 1940. Cover of 1940 report on the Crooks site by James A. Ford and Gordon R. Willey, two of the leading American archeologists of the day. Middle Woodland Marksville Incised pottery from Crooks Mound, La Salle Parish, Louisiana. From Ford and Willey, 1940. This classic Marksville Stamped bowl from Coral Snake Mound was probably made in the lower Mississippi Valley some 100 miles to the east. 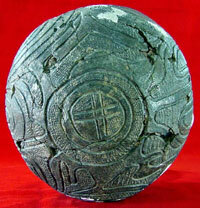 Bottom of Marksville Stamped bowl from Coral Snake Mound on the Sabine River under what is now Toledo Bend Reservoir. 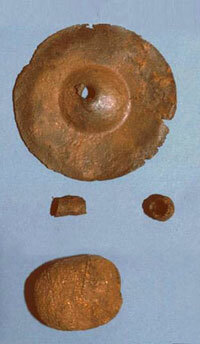 Copper ear spools and a large copper pendant from Coral Snake Mound. Jensen, 1968, courtesy Texas Archeological Society, BTAS 39. 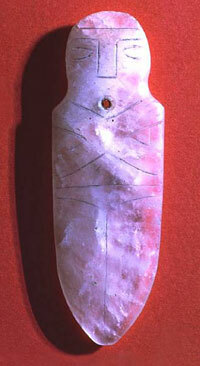 Polished, semi-translucent quartz pendant with incised human figure from Coral Snake Mound. The raw material probably came from the Ouachita Mountains. TARL archives. Woodland period cultural developments help us understand the crystallization of the Caddo culture tradition around A.D. 800. As is the case with the Archaic, the Woodland concept began as a developmental stage and is used as a major time period dated somewhat differently from region to region. Between about 1000 and 400 B.C. the use of pottery spread across the Eastern Woodlands followed by (and sometimes accompanied by) increasingly settled village life, the building of burial mounds, the establishment of extensive long-distance trade networks (or the expansion of existing ones), the development of elaborate ritual practices, the domestication and cultivation of native plants with starchy and oily seeds, and the rise of societies led by hereditary leaders. These Woodland period developments span two millennia from about 1000 B.C. to as late as A.D. 1000 and, as discussed in the previous section, can be traced back to patterns that began in the Archaic period. Because the timing and nature of these Woodland developments varied considerably across the Southeast, it is difficult to make accurate generalizations. Here we will stick primarily to what is known about the Caddo area and the adjacent lower Mississippi Valley. Occupying the southwestern edge of the Eastern Woodlands, the Caddo Homeland was a cultural frontier of sorts that lay beyond (west of) the areas where most of the early and middle Woodland developments took place. Pottery, for instance, didn't reach east Texas until after 500 B.C. and wasn't in common use in some parts of the area until over a thousand years later. Yet, by Late Woodland times, about A.D. 800 or shortly thereafter, a seemingly precocious Early Caddo culture emerged with many of the elements considered characteristic of the Mississippian period after A.D. 1000. Explaining or even briefly reviewing Woodland developments as they relate to the ancestors of the Caddo is a challenge. We do not have enough solid data to explain what happened century by century or even subperiod by subperiod because somewhat different things happened at different times in different areas. For some areas, such as the lower Mississippi Valley, the timing and sequence of developments is relatively well known. This is not the case in most of the Caddo Homeland. So we will divide this section into two parts: Woodland Developments Through Time and Woodland Cultures of the Greater Caddo Homeland. The first part summarizes the chronological sequence of Woodland developments in the nearby lower Mississippi Valley with discussion of certain related developments in the Caddo area. The second part reviews the specific Woodland-period cultures from which Caddo culture developed. Only a few days travel by canoe downstream from the Great Bend of the Red River is the lower Mississippi Valley (LMV), a region that helps us understand the Woodland period. The rich environment of the wide, alluvium-filled valley with its many river channels, tributaries, oxbow lakes, and meandering bayous supported relatively large human populations for thousands of years. It was here (including the adjacent lower Ouachita River basin near Monroe, Louisiana) that the first earthen mounds were built by Middle Archaic peoples as early as 6,000 years ago (4000 B.C.). In Late Archaic times, about 3700-3000 years ago (1700-1000 B.C. ), Poverty Point culture flourished in the same area. While these early cultures have no known parallel in the Caddo Homeland, they set the stage for a succession of Woodland cultures in the LMV that interacted with Caddo ancestors for over a thousand years. The sequence of cultures in the LMV is relatively well known because the region's abundant archeological sites, many of them with impressive earthen mounds, have long attracted investigation. 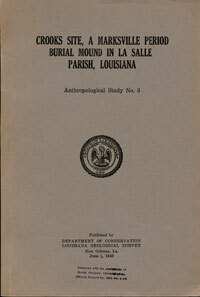 Two of the most famous American archeologists, James Ford and Gordon Willey, excavated a series of mound sites in the LMV in the late 1930s and early 1940s and triggered a decades-long debate concerning the origin and evolution of the mound-building cultures of the region. Ford's hypothesis that cultural developments in the LMV were derived from Mesoamerican cultures (like the Olmec) is no longer seen as valid. Instead, the LMV appears to have a very long history of indigenous (local) development within which were periods of great interaction with other cultures of the Eastern Woodlands and periods of relative isolation. The Early Woodland period in the LMV is called the Tchefuncte culture and dates to between 800-200 B.C. Tchefuncte (pronounced cha-funk-tee) peoples lived along the coast of Louisiana and the inland waterways of the LMV. They were hunters, fishers, clam-harvesters, and plant gatherers. The atlatl (spear or dart-thrower) and dart was the favored weapon. Most Tchefuncte sites are relatively small and only a few are known to have mounds. 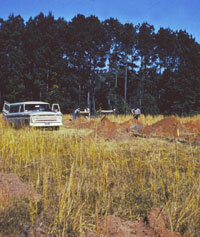 The known mounds appear to be burial mounds covering flexed or bundled burials. (Bundle burials are defleshed and disarticulated skeletons that were later reassembled and tied together in individual bundles.) There are few special grave offerings or other evidence of the existence of different social classes. Instead Tchefuncte societies seem to have been egalitarian. Trade connections to other areas of the Southeast are few compared to what came before (Poverty Point) and after (Marksville). Tchefuncte culture is best known for its pottery and is the first LMV culture to make much pottery. 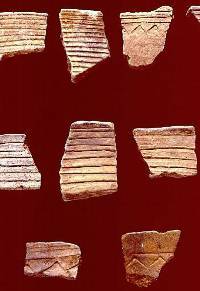 (Some early fiber-tempered pottery is known from Poverty Point.) Tchefuncte pottery is soft and poorly fired; its highly distinctive paste appears laminated (layered) and poorly mixed and may not contain temper. 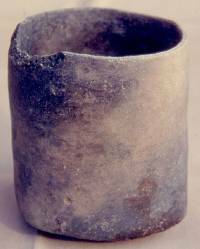 (Tchefuncte pottery was probably made by the paddle and anvil technique instead of the coil method.) It looks like potters were experimenting with a new technology and taking part in what has been called the "container revolution." The most common vessel forms are simple globe-like bowls and "flower pot" jars. The exterior surfaces are often decorated with stamped designs, incised lines, incised rims, and punctations. Also common are teat-shaped legs or supports, often occurring in sets of four. 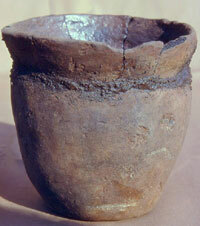 The earliest pottery in the Caddo Homeland dates to perhaps 400 B.C. and appears to be derived from the Tchefuncte culture. 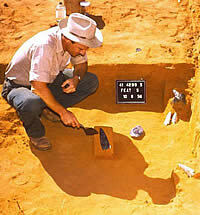 Scattered finds of Tchefuncte pottery are known from the Caddo area. For instance, two reconstructable vessels were found at the Resch site in Harrison County, Texas on a tributary of the Sabine River. The Tchefuncte jar from Resch shown on the right is better made than most and has grog (pulverized pottery) temper. Tchefuncte-like pottery (most of it locally made) is more common in southeast Texas, indicating contact with LMV peoples or perhaps some Tchefuncte groups migrated westward along the upper Texas Gulf coast. In later Woodland times, the Mossy Grove culture (see Part 2) continued a tradition of sandy paste pottery that may have had Tchefuncte origins. Following Tchefuncte in the LMV is the Marksville culture (about 200 B.C. to A.D. 500) during the Middle Woodland period. This era is a time of population growth and larger sites, many of which have conical burial mounds and some have more elaborate earthworks. Marksville pottery is harder and better made than Tchefuncte pottery and has more variation in form and decoration. Stamped and incised bowls are particularly common. Incised birds, curvilinear patterns, and deep U-shaped incisions are characteristic Marksville pottery decorations. The basic economy was still hunting, gathering, and fishing; the atlatl was still in use. Perhaps the most outstanding feature of Marksville culture is the extensive evidence for interaction with Hopewell peoples in Illinois and other distant locales. Numerous mound sites are known in the LMV that date to early Marksville times (prior to A.D. 200) including the large, complicated Marksville site in south-central Louisiana that gave the culture its name. The Marksville site had a C-shaped earthen embankment some 1000 meters (almost 1100 yards) long and 2 meters (6 feet) high within which were five mounds, at least three of which were conical burial mounds. Two mounds had flat tops and may have been platforms for special structures, perhaps temples, although this is uncertain. 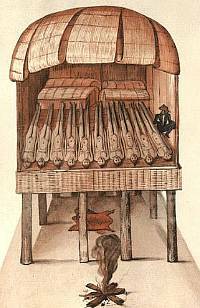 Within one of the burial mounds was a log-covered pit sealed by layers of cane and clay that may represent a "charnal" house where the bodies of the dead were processed before mass burial. Many examples of elaborate mortuary ritual are found at Middle Woodland sites including cremation, bundle burials, separate burial of skulls and mandibles, mass burials, and exotic grave offerings. At Crooks Mound in south-central Louisiana, a large conical burial mound some 26 meters (85 feet) in diameter and over 5 meters (16 feet) high contained the remains of 1159 individuals buried separately in different episodes of mound use. Most burials were in the flexed position, but numerous isolated skulls, mandibles, and bundle burials were also found. A small number of grave goods including whole pottery vessels and an assortment of exotic items such as copper ear spools show connections with distant peoples. While the extraordinary concentration of burials at Crooks is by far the largest known, burial mounds are thought to represent communal cemeteries that served a particular social group. The early Marksville culture was part of the Adena-Hopewell phenomenon, a broad cultural pattern or "interaction sphere" that can be found in much of the Midwest throughout the Mississippi drainage system. Adena culture is known mainly from the Ohio River valley and is the Early Woodland predecessor (about 600-100 B.C.) of Middle Woodland Hopewell. Major Hopewell sites have conical burial mounds and elaborate earthworks, some shaped like birds or animals, and are concentrated in two core areas, one in central Ohio and the other to the west in central Illinois. While some archeologists once thought that the Marksville culture was the result of the movement of Hopewell groups down the Mississippi, most now believe that Marksville represents the local evolution of Tchefuncte culture and their contact with Hopewell peoples elsewhere. Whatever the exact mechanism, ideas and exotic items linked to ritual and symbols of power moved long distances during the Middle Woodland period. The exotic (non-local) objects are found as grave goods in Hopewell and Marksville burial mounds. Items such as ear spools, bracelets and beads, pendants and gorgets (chest ornaments) made of exotic copper, stone, pearl, and marine shell, quartz crystals, elaborately decorated ceramic vessels, platform pipes, celts made of green stone, and finely made large dart or spear points have been found at hundreds of Middle Woodland sites across the central and southeastern United States. Altogether, the raw material sources and the Hopewell-related burial mound locations form a vast network extending over 800 miles east-west and some 1000 miles north-south. "Indian Charnal House" by John White, ca. 1586. Charnal houses are special buildings where the bodies of the deceased are stored while their flesh decays. The woven boxes at the rear may have contained defleshed bones or offerings (or both). The seated figure on the right is said to be a wooden idol, probably representing an ancestral figure. Although this famous watercolor drawing depicts a charnal house of the Algonkian Indians in Virginia, similar mortuary buildings were used by many groups in the Eastern Woodlands, including those who lived in the Caddo Homeland in the Early to Middle Woodland period. Original at the British Museum. Lower Mississippi Valley showing the locations of the Marksville and Crooks sites and the Ouachita and Red Rivers confluences. From Ford and Willey, 1940. This unusual vessel from the Resch site in Harrison County, Texas, is a rare example of a very early pottery type, Tchefuncte Stamped, variety Resch. 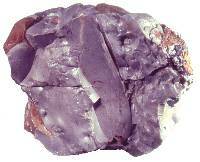 Its precise age is unknown, but is believed to date to about 400 B.C. The rows of triangles were apparently formed by a wooden stamp. The base of the vessel has a scalloped pattern of small supports ringing a flat bottom. The vessel is grog-tempered. It is small, measuring only 17.2 cm (6.8") high with a basal diameter of 10 cm (4") and a rim diameter of 15.5 cm (6.2"). Drawing courtesy Texas Archeological Society, from BTAS 40. Middle Woodland Marksville Plain pottery vessels from Crooks Mound, La Salle Parish, Louisiana. From Ford and Willey, 1940. Middle Woodland Marksville Stamped from Crooks Mound, La Salle Parish, Louisiana. From Ford and Willey, 1940. 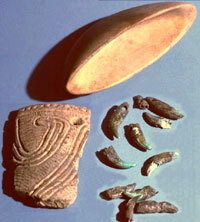 Copper artifacts from Coral Snake Mound deposited as grave offerings or ritual caches. 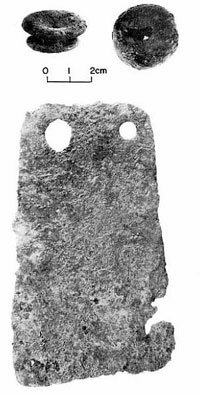 The two large disk-shaped pieces are thin copper sheets that were part of composite ornaments and probably affixed to wooden backs. In the middle are three rolled copper beads. At the bottom are two copper nugget beads. TARL archives. Schematic profile through Coral Snake Mound. The mound apparently covered a large pit within which a primary cremation had occurred. The mound itself was built in two stages. A thin layer of gray sand capped the first stage. Cremation deposits, fire pits, artifact caches, and bundle burials were found within both stages. It is not known whether the mound was in use (and built) over a lengthy period of time, as the original excavator believed, or a relatively short period. Jensen, 1968, Courtesy Texas Archeological Society, BTAS 39. Exotic artifacts from Coral Snake Mound. The polished boatstone may have functioned as an atlatl (spear-thrower) counterweight; if so, the facts that it is made from non-local stone and that its manufacture was extremely labor-intensive suggests that it was made for ritual purposes. The perforated raccoon teeth on the right were fortuitously preserved by copper salts--the necklace they once graced was in contact with copper artifacts. The large potsherd on the left is from a Marksville Stamped vessel. TARL archives. The Hopewellian exchange network and, more generally, Middle Woodland developments, reached the Caddo Homeland, although the area remained a cultural frontier. Most of the known examples are concentrated in southwest Arkansas and northwest Louisiana. 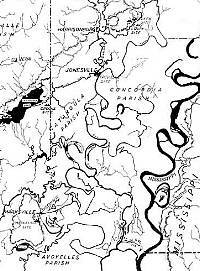 A bit farther south is the Coral Snake Mound on the Louisiana side of the Sabine River under what is now Toledo Bend Reservoir. This conical burial mound was 24 meters in diameter (78 feet) and 2.5 meters high (8 feet) and contained at least 35 cremation deposits, 14 bundle burials, 10 fire basins, and 14 artifact caches (the mound was only partially excavated). Beneath the mound was a single primary cremation that was capped by the first layer of the mound. All of the burials within the mound were in secondary context and had been placed in the mound after being cremated or prepared elsewhere, which suggests that mortuary rituals were complex. The fact that most of the cremation deposits were confined to very small areas 6 to 12 inches (15-30 centimeters) in diameter indicates they may have been contained in individual baskets placed in small pits. This pattern might be expected if the cremations occurred elsewhere, perhaps even miles away, and fits in with the notion that Coral Snake Mound was a communal cemetery that served people living along that stretch of the Sabine River. Coral Snake Mound, a Middle Woodland burial mound on the Louisiana side of the Sabine River. Now under Toledo Bend Reservoir, this mound contained cremation deposits, bundle burials, fire pits, and artifact caches that link it with developments seen across much of the Eastern Woodlands. TARL archives. Jonas Short Mound under excavation. The man on the right is standing at about the original ground surface. Most of the mound seems to have been built in a single construction episode. TARL archives. Perforated elk teeth (preserved by proximity to copper artifacts) and quartz crystals from Jonas Short. 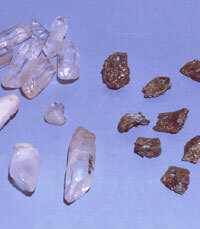 Five of the crystals were shaped and perforated or grooved to serve as pendants. TARL archives. These large dart points and knives from the Jonas Short Mound were obviously made by a master knapper and used as ritual items. The flake scars (chipping marks) on the extraordinary yellow point have been completely obliterated by polishing, underscoring its symbolic value. TARL archives. Large dart points knives as they were found within the Jonas Short Mound. TARL archives. The approximate limits of the Woodland culture areas defined within the main Caddo Homeland and some of the better known Woodland sites dating between about 500 B.C. and A.D. 800. Graphic by Dee Ann Story. Test excavations underway in 1963 at the Late Woodland Pace site on the Louisiana side of Sabine River just above Toledo Bend Reservoir. TARL archives. The hallmark of Fourche Maline culture is a well-developed ceramic tradition known for its plain and minimally decorated flat-bottomed vessels shaped like flower pots. 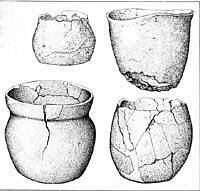 Late Woodland pottery vessels from the Fanny Snipes site on the Sulphur River near Texarkana. The jar on the left resembles French-Fork Incised, a Coles Creek type, but was probably made locally. On the right is a typical "flowerpot" Williams Plain flat-bottomed jar, one of the hallmarks of Fourche Maline culture. TARL archives. 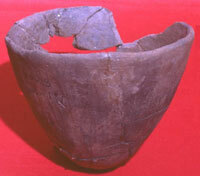 Typical Fourche Maline Williams Plain jar from the Crenshaw site, Miller County, Arkansas. Photo by Frank Schambach. The hallmark of Mossy Grove culture, its sandy paste ceramic tradition, was probably introduced or inspired by the Tchefuncte culture in the lower Mississippi Valley. Flared-rim Williams Plain jar from Fourche Maline contexts at the Crenshaw site, Miller County, Arkansas. Photo by Frank Schambach. The Mill Creek culture encompasses the period from about 200 B.C. to A.D. 800 and is contemporaneous with Fourche Maline and Mossy Grove, but different from either. 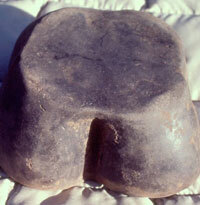 Double-bitted stone axes are often found in Fourche Maline sites. These examples are from Red River County, Texas. TARL archives. Only a few of the burials at Coral Snake Mound were definitely accompanied by grave goods, but small numbers of exotic artifacts were placed into the mound as caches or discrete clusters. Some artifact caches and other isolated artifacts may actually represent burials in which the bones did not survive. Regardless, these artifacts clearly represent purposeful deposits of offerings honoring the dead. Among the unusual artifacts are rolled copper beads, copper gorgets, perforated raccoon teeth, two Marksville pots, two boatstones (ground and polished artifacts shaped like a boat), and a unique quartz figurine. The captions of the accompanying photographs provide further details. Three radiocarbon dates and the associated Marksville pots indicate that Coral Snake Mound was in use during Middle Woodland times in the early centuries A.D. Some effort was made to locate contemporary habitation areas that might have been associated with the mound/cemetery, but none were found. Scattered artifacts found in and near the mound such as pottery sherds, flint flakes, and broken dart points, probably represent occupational debris, but the mound site itself appears to be mainly a cemetery. The precise cultural affiliation of Coral Snake is debated. While it could represent an as-yet poorly known local Woodland group, Arkansas archeologist Frank Schambach argues that Coral Snake Mound is part of Fourche Maline culture. Another somewhat similar site is the Jonas Short Mound located on the Angelina River under what is today Sam Rayburn Reservoir, some 40 miles (70 kilometers) west of Coral Snake. The Jonas Short Mound was 29 meters (94 feet) in diameter and 2.4 meters high (almost 8 feet) and was built over the cremated remains of at least two individuals placed into a shallow pit. Charcoal and scorched earth suggest that the cremation took place within the pit, followed soon by the building of the mound, probably in two stages. The cremated remains were accompanied by two copper bracelets. Five artifact caches were found in the mound fill that may have accompanied burials (if so, the bones decayed completely) or may be offerings honoring the cremated individuals. Among the unusual artifacts in these caches are boatstones, perforated elk teeth, a copper reel-shaped gorget, large chipped stone knives (bifaces), an extraordinary polished dart point, and 11 quartz crystals, 5 of which were shaped and perforated or grooved to serve as pendants. 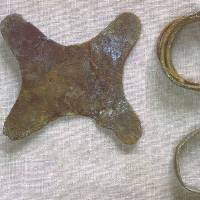 The date of Jonas Short Mound is uncertain, but it probably dates to the Middle Woodland period as well and may be a bit earlier than Coral Snake judging by the reel-shaped copper gorget. Similar artifacts are known from early Marksville burial mounds and in burial mounds of the Adena culture of the Ohio River valley far to the northeast. The presence of plain sand-tempered pottery and the absence of Marksville pottery or bone- or grog-tempered pottery suggests that Jonas Short was created by a different culture than that of Coral Snake (or possibly by the same culture in earlier days). It falls within the area where the Mossy Grove culture existed, as discussed in Part 2. Schambach thinks Jonas Short is also part of the Fourche Maline tradition. Other Middle Woodland sites with burial mounds occur in the vicinity of the Great Bend of the Red River in northwest Louisiana and southwest Arkansas. In fact, there are probably as many Middle Woodland mound sites in the eastern part of the Caddo Homeland as there are in the LMV, although few are well known. The Bellevue Mound and related sites in northwest Louisiana were thought by earlier researchers to represent a phase of the Marksville culture. Such LMV-centric views are no longer widely held today, as archeologists in the region see much evidence of local developments that parallel those of the lower Mississippi Valley. Arkansas archeologist Frank Schambach sees these sites as early expressions of Fourche Maline culture (see Part 2). 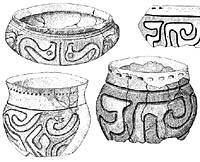 In Arkansas, Shane's Mound and Red Hill Mound are examples of burial mounds with similar grave offerings to those found at Coral Snake including a Marksville stamped bowl containing copper beads (Red Hill). Both mounds are associated with nearby habitation areas (middens) and both are attributed to Fourche Maline. Interestingly, both the Bellevue Mound and the Cicero Young Mound (in Arkansas) were built over the remains of structures, a practice which is common at Caddo sites. These may be early examples of mounds that mark civic and ritual centers. This is hard to demonstrate because what little work has been done at most of these sites has focused only on the mounds themselves. The succeeding Late Woodland era in the lower Mississippi valley is divided into two periods, Baytown (about A.D. 500 to 750) and Coles Creek (about A.D. 750 to 1000), and is a time of great change. Compared to Marksville, there are more sites, much more ceramic variability, more densely concentrated populations, and fewer graves with exotic offerings. Three new developments during the Late Woodland in the LMV are particularly important: the gradual adoption and increasing importance of agriculture, the replacement of the atlatl and dart with the bow and arrow around A.D. 700, and the construction of planned villages and civic/ritual centers ("mound centers") with flat-topped structural "platform" mounds arranged around an open plaza. These complex, interlinked changes coincide with (and are no doubt related to) comparable developments in many parts of the Midwest and Southeast including the Caddo Homeland. We would argue that by about A.D. 800, developments in the LMV no longer overshadow and anticipate those in the Caddo area. Said differently, Caddo culture emerges as a distinct pattern during the Late Woodland period. The above map shows the approximate location of some of the major archeological cultures dating to the Woodland period between about 500 B.C. and A.D. 700. As we have seen, there was a succession of Woodland cultures within the LMV spanning this 1300-year era. Unfortunately, the chronology of Woodland developments in the Caddo area is poorly known except by general comparison to the LMV sequence. Somewhat clearer is the geographical distribution of some of the major Woodland cultural patterns in and near the Caddo Homeland as shown in the accompanying map. Before discussing the three Woodland cultures whose boundaries partially overlap with the area that would soon become the main Caddo Homeland, brief mention will be made of three related patterns, two comparatively well known and the other newly proposed and a matter of debate. The influence of Middle to Late Woodland cultures of the LMV seems to have extended well up the Red River into the southeastern part of what would become the Caddo Homeland. Based on data from excavations at the Fredericks, Black Lake Bayou, and Lemoine sites (among others) in the vicinity of Natchitoches, Louisiana, archeologist Pete Gregory has defined the Fredericks phase (about A.D. 400-700) and succeeding Lemoine phase (A.D. 700-900). Sites of both phases are dominated by what appear to be locally made LMV pottery types. By A.D. 1000, Early Caddo sites dominate the area, but it isn't clear whether this represents the movement of people or the spread of the Caddo cultural tradition into the Natchitoches area. The Late Woodland Plum Bayou culture existed in the alluvial lowlands along the lower Arkansas and White Rivers and the adjacent Mississippi Valley in eastern Arkansas between A.D. 700-1000. The best known Plum Bayou site is Toltec Mounds, a major civic/ritual mound center containing 18 earthen mounds enclosed by a C-shaped pattern of earthen berms and ditches. Ten of the mounds at Toltec are arranged around a rectangular plaza centered on the largest mound, which is about 15 meters (50 feet) high. Plum Bayou culture developed out of Baytown and is considered by many to be the northern part of the LMV Late Woodland pattern. Interaction with Fourche Maline and early Caddo peoples to the west and southwest is indicated by similarities in pottery and by imported lithic (stone) materials from the Ouachita Mountains in southwest Arkansas. Schambach recently proposed the name "Mulberry River" to characterize the Woodland culture that inhabited the valleys of the middle Arkansas River and its tributaries to the north of the Ouachita Mountains in eastern Oklahoma and northwestern Arkansas. Mulberry River culture is said to be ancestral to the Arkansas Basin ("Northern Caddoan") culture that developed in the same area after A.D. 900 and created the spectacular Spiro site. While some Oklahoma archeologists apparently consider the area part of the Fourche Maline Woodland culture, Schambach sees Mulberry River as being distinct from Fourche Maline. He points to differences in artifacts, settlement patterns, and adaptation that set the two cultures apart. The most compelling line of evidence comes from a study of dental patterns that suggests the peoples living in the Arkansas Valley were genetically distinct from those living in the main Caddo Homeland from Woodland times forward. Be this as it may, Oklahoma archeologist Don Wyckoff sees no archeological basis for considering local Woodland sites to be anything other than Fourche Maline. As discussed below, the name and the original definition of Fourche Maline culture is based on work done in the along tributaries of the Arkansas River in eastern Oklahoma. Published statements by various Oklahoma archeologists including Jerry Galm, Robert Bell, and Wyckoff state that Fourche Maline sites are only found in the valleys of the northern Ouachita Mountains, while the Arkansas Valley, proper, was unoccupied until after A.D. 700. Suffice it to say that the Mulberry River culture concept is still in its infancy and may not survive. Proposed archeological concepts are often like thatsome stick and some sink. Happily, here we are far more concerned with the Woodland cultures of the main Caddo Homeland south of the Arkansas River Valley. The most distinctive Woodland cultural pattern in the main Caddo Homeland is the long-lived Fourche Maline (pronounced foosh-ma-lean) culture tradition. It is named after a creek in the Wister Valley of southeastern Oklahoma where the "type" sites (those first used to define the pattern) were excavated by WPA teams in the late 1930s. These sites had distinctive thick, dark middens called "black mounds" that contained a mix of Archaic, Woodland, and Mississippian artifacts as well as burials. Beginning in the 1970s, the Fourche Maline concept has been expanded and redefined by Frank Schambach to characterize the Woodland cultures in southeastern Oklahoma, southwestern Arkansas and adjacent areas of Louisiana and Texas. Beginning dates are uncertain, but the earliest Fourche Maline sites probably date to Early Woodland times, before 500 B.C., while the latest date to A.D. 800 (or later), a span of at least 13 centuries. Schambach has divided the Fourche Maline time span into seven numbered periods that correspond to the LMV sequence. He has also defined six Fourche Maline phases covering different subareas and spans of time. Because the dating for these phases (and the periods, too) is based mainly on cross-dating with LMV ceramics, other archeologists, such as Story and Perttula, regard them as highly conjectural. Outside the Wister Valley, the best archeological evidence of Fourche Maline culture comes from the Red River and Ouachita River drainages in southwestern Arkansas where some 700 related sites have been recorded. Southwestern Arkansas and adjacent areas of Oklahoma, Louisiana, and Texas appear to have been the core area of Fourche Maline culture where some of the oldest, largest, and most intensively occupied sites are found. Fourche Maline sites are known for their thick, black middens resulting from habitation and trash accumulation over lengthy periods of time. It is assumed that villages once stood in these places, although little direct evidence of dwellings have been found, probably because Fourche Maline houses weren't very substantial. While most sites are relatively small, larger villages covering 2 hectares (about 5 acres) also occur. The hallmark of Fourche Maline culture is a well-developed ceramic tradition known for its plain and minimally decorated flat-bottomed vessels. The most common form is a jar shaped like a flower pot. 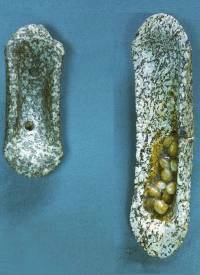 Fourche Maline ceramics typically have thick walls and are tempered with a variety of materials including grog, bone, grit, and sand. The most common type is Williams Plain followed by Cooper Boneware and Ouachita Plain. 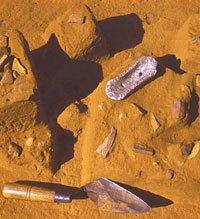 Excavations of Fourche Maline middens often yield thousands of pottery sherds. Trade pieces of Marksville and Coles Creek pottery are known, but more common are locally made imitations of LMV pottery. 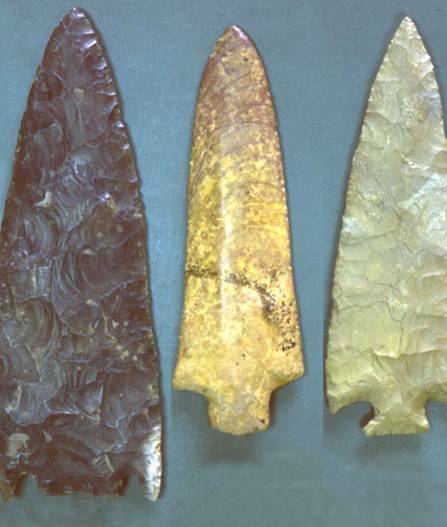 Other characteristic artifact types include Gary dart points and, after about A.D. 500, expanding stem arrow points, as well as boatstones, double-bitted "axes" (possibly gardening hoes), clay platform pipes, and seed grinding and nutting stones. The economy of Fourche Maline peoples is still something of a mystery. They obviously continued the Archaic hunting and gathering tradition and lived in part off of deer, turkey, and hickory nuts as well as many other wild plants and animals. The mysterious part is the extent to which they were gardeners. It seems likely that, through time, Fourche Maline peoples began growing various native crops including the starchy and oily plants that were domesticated first in the American Midwest as well as squash and bottle gourds. While little direct evidence of gardening so far has been recovered from Fourche Maline sites, this is probably due mainly to the recovery techniques. (Small charred seeds are only preserved in favorable conditions and can only be recovered by using a specialized soil processing method called flotation.) Indirect evidence of horticulture includes the presence of double-bitted "axes" (possible garden-hoe blades), the dense refuse accumulations (black middens) at many Fourche Maline sites, and the increasing evidence that neighboring Woodland groups living east, north, and west of the area were part-time gardeners. 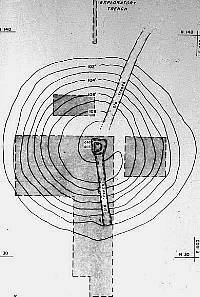 Between A.D. 100-300, burial mounds such as those at Red Hill and McKinney in the Red River valley were no longer built over crematoria. 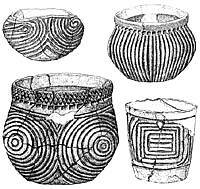 Instead they have secondary deposits of cremations (McKinney) that are associated with exotic Hopewell-related artifacts, and Marksville Stamped bowls. Although neither of these mounds is well known, Schambach believes they are similar to Coral Snake Mound, which he also considers to be a Fourche Maline site. The latest Fourche Maline burial mounds are Mounds C and D at the Crenshaw site and are thought to date to A.D. 600-700. These mounds were built in stages and have deposits of skulls and mandibles with pottery vessels and other offerings that were placed on the surfaces of the mound stages and then covered by thin clay caps. Schambach argues that Fourche Maline culture represents the mother culture from which the Caddo cultural tradition develops and sees Fourche Maline peoples as the direct ancestors of later Caddo peoples. There is much evidence to support this view. The most obvious is the fact that the core area of Fourche Maline closely coincides with the core area of the Caddo Homeland coupled with the absence of a gap in time between the two cultural traditions. There are seemingly abrupt changes in behavior including new burial patterns, ceramic styles, increased mound building, increasing use of mounds as building platforms, ritual destruction and capping of public buildings, and the introduction of maize agriculture. Nonetheless, these appear to represent local social and economic developments rather than the movement of a new people into the area. While these changes may seem abrupt, the cultural transformation from Fourche Maline to Early Caddo probably transpired over several hundred years (ca. A.D. 700-900) and it may well be more complicated than implied by the mother culture idea. There are two other Woodland cultures that probably contributed to the development of the Caddo cultural tradition, Mill Creek and Mossy Grove. The Woodland period archeological pattern in southeast Texas along the upper Gulf coast and inland into the southern part of the Piney Woods looks quite different from Fourche Maline. Many of the differences obviously relate to the contrasting environments. Southeast Texas has greater rainfall, higher humidity, a longer growing season, more swamps, less oak-hickory forest, and, of course, the estuaries, bays, and barrier islands along the Gulf Coast. These environmental differences resulted in dissimilar economic patterns, access to raw materials (scarcity of stone, for instance), shelter needs, and so on. The area is also less conducive to farming. Farther inland toward what would become the southern boundary of the Caddo Homeland, away from the relatively narrow river valleys, there are deep sandy soils that are not very fertile and dry out quickly during droughts. From early historic records we know that much of Southeast Texas, particularly along the coast and major bay systems (and adjacent inland areas), was occupied by non-Caddoan speakers such as the Bidai, Atakapa, and Akokisas peoples. The archeological record suggests that the historically known patterns began developing thousands of years ago, certainly by Woodland times. In the early 1990s, Dee Ann Story called attention to the archeological similarities across much of Southeast Texas, especially the shared sandy paste pottery tradition, and termed this pattern the Mossy Grove cultural tradition. While the Mossy Grove tradition can be traced into historic times, our interest here is on the Woodland or "Early Ceramic" period, beginning by at least 200 B.C. and probably earlier. Unfortunately for our present purpose, the archeological sequence of the coastal Mossy Grove culture is much better known than that present within the southern part of the area we recognize as the Caddo homeland. The hallmark of Mossy Grove culture, its sandy paste ceramic tradition, was probably introduced or inspired by the Tchefuncte culture in the LMV as is evident from finds of Tchefuncte-like pottery at both coastal and Inland Mossy Grove sites. 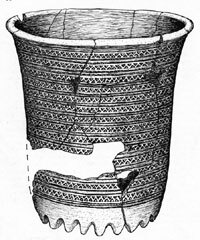 In contrast to the thick-walled, flat-bottomed plainwares of Fourche Maline, Mossy Grove peoples created relatively thin-walled, round- or conical-bottomed vessels. The double-bitted axes and polished stone artifacts found in Fourche Maline sites are absent. Mossy Grove projectile points include small Gary and Kent dart points and, after A.D. 500-600, expanding stem arrow points of the Friley and Scallorn types. These artifacts and various knives (bifaces) and heavier chopping tools are made of poor quality local materials, often petrified wood. 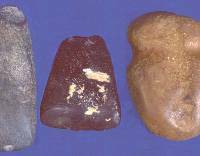 Another local raw material for making chipped stone tools is Manning glass, a fused volcanic material that outcrops in a narrow east-west band near the southern limit of the Caddo Homeland just north of Huntsville, Texas. In the northern Mossy Grove area, along the upper Angelina and Neches River valleys, Woodland sites are very common and account for 25-50% of the known sites. The increase in sites compared to the Archaic period is also coupled with a shift in settlement location from upland areas and higher ridge tops to the low sandy ridges ("interfluves") overlooking the confluences of small drainages. Archeologist Jim Corbin has speculated that this shift may be tied to the beginnings of gardening, although so far there is no direct evidence of early domesticated plants. The sandy, acidic sediments of the area make for poor preservation of organic materials. In East Texas to the west and south of the Red River and its tributary, the Sulphur River, Woodland archeological sites seem to differ significantly from the Fourche Maline pattern. For one thing there are far fewer Woodland sites and those that are present are smaller and don't seem to have the characteristically thick, black middens with abundant Williams Plain pottery. The relatively small amounts of pottery that the East Texas sites have is more varied; it is typically thinner than Williams Plain and more often decorated with incised lines, punctations, and other designs. Archeologist Tim Perttula has recently argued that these and other differences suggest that a distinct cultural pattern existed in the western frontier of the Eastern Woodlands in the Pineywoods of East Texas and the Post Oak Savanna. Perttula hypothesizes that Mill Creek groups moved around more (i.e., were less sedentary) than than Fourche Maline, based on the presence of only relatively small sites and small middens. The fact that ceramics are not abundant at Mill Creek sites compared to Fourche Maline or Mossy Grove sites, may represents regional differences in food processing. Mill Creek peoples appear to have relied on traditional cooking and storage techniques such as pit-oven cooking and storage pits rather than on ceramic technology. Mill Creek peoples still practiced the hunting and gathering lifestyle of their Archaic predecessors and relied heavily on nuts and deer. No structures, burials, or burial mounds have yet been identified at Mill Creek sites. Stone tools include small Gary and Kent dart points eventually being replaced by expanding-stem arrow points about A.D. 600-700. 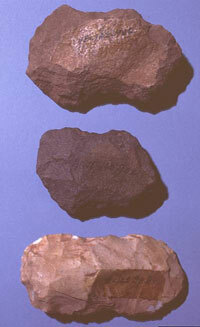 Ground stone tools, particularly manos and pitted nutting stones are common. Double-bitted "axes" are uncommon as are other potential gardening tools. Most stone tools are made of local quartzite, sandstone, siltstone and petrified wood. 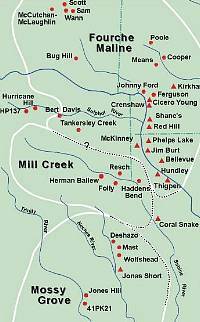 The best known Mill Creek site is the Herman Bellew site, which overlooks Mill Creek, a tributary of the Sabine River in northern Rusk County. The Woodland ceramics from the site include sandy paste, grog-tempered, and bone-tempered sherds, a relatively high percentage of which are decorated (6% compared to less than 3% for most Fourche Maline sites). Despite relatively extensive excavation, only 225 sherds were recovered at Herman Bellew. In comparison, many Fourche Maline sites have yielded thousands of sherds. According to Perttula, Mill Creek pottery differs from the typically thick, grog-tempered Williams Plain. Instead, there is a mix of sandy paste wares, bone-tempered wares, and thinner grog-tempered wares, primarily plain. Perttula thinks Mill Creek groups may have adopted ceramic ideas and technologies from the two neighboring Woodland cultures with whom they were interacting. From the Fourche Maline tradition came grog- and bone-tempered pottery with mainly flat-based bowls and jars combined with the Mossy Grove tradition of non-tempered sandy paste wares with round-based vessels. Alternatively, the apparent borrowing from adjacent cultures may simply be changes through time in manufacturing technique and vessel shape that represents the evolution of ceramic use for different purposes by Mill Creek peoples. Another important difference between Fourche Maline and Mill Creek is the presence in the latter of rock hearths and storage pits. Small rock hearths (probable earth ovens) and larger concentrations of fire-cracked cooking stones were found in Woodland contexts at Herman Bellew, suggesting that the Archaic pattern of using hot rocks to cook plant foods (especially roots) was still prevalent. 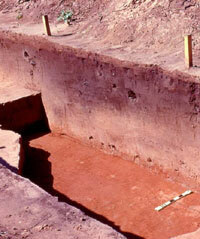 Another example of a continued Archaic pattern is a large storage pit dating to about A.D. 100-200. These developments and changes were not simultaneous, and they did not take place all across the region. We still do not understand either the exact sequences of development, or the processes of change. In a sense most of these Woodland elements were different parts of the same general process, the transformation from small egalitarian groups of mobile hunters and gatherers to larger, ranked societies who depended on agriculture. The Fourche Maline culture of the Red River valley was almost certainly the main "mother" culture out of which the Caddo cultural tradition evolved. But that doesn't mean that all of the ancestral Caddo groups were part of the Fourche Maline tradition. Ancestral Caddo peoples may have been responsible for the Mill Creek culture to the south and west of the Fourche Maline. Mossy Grove culture, on the other hand, probably represents the ancestors of non-Caddo peoples, but they were clearly interacting with Mill Creek and Fourche Maline peoples. Said differently, Woodland groups across the Caddo Homeland developed localized ways of doing things that had their origins long before A.D. 800. The smaller groups that lived on the western and southern fringes were probably perceived as being akin to "country hicks" (or perhaps even enemies) by the larger, more mainstream groups that lived in the Caddo "heartland"the Red River Valley at and below the Great Bend. Reel-shaped copper gorget and copper bracelets from Jonas Short. Similar reel-shaped artifacts are known from early Marksville burial mounds and in burial mounds of the Adena culture of the Ohio River valley far to the northeast. TARL archives. Map showing area excavated at the Jonas Short Mound. TARL archives. These boatstones from Jonas Short Mound are made from syenite and probably come from outcrops near Little Rock, Arkansas. The smooth river pebbles in the one on the right are still in the original find position within the boatstone. These probably served as rattles held within because the boatstone was tightly affixed to its atlatl. This lends additional support to the notion that atlatls with exotic boatstones were strictly ritual objectswhat hunter would want his presence announced by a loud rattle? TARL archives. Apparent artifact caches found within Jonas Short Mound may have once been associated with cremated burials. If so, the evidence was not preserved. 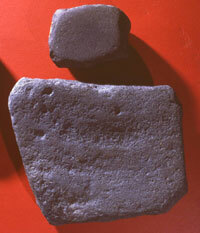 The syenite boatstone is obviously a ritual artifact, but the smaller bits look like ordinary debris. TARL archives. Coles Creek-like pottery from the Pace site on the Louisiana side of Sabine River just above Toledo Bend Reservoir. TARL archives. Buried Fourche Maline midden exposed in excavation wall at the Crenshaw site. Although the dark stain of this midden is clearly visible, some Fourche Maline middens are so dark they are described as being black. Courtesy Frank Schambach. Polished stone celts and grooved axe from Fanny Snipes site. The celts probably date to Late Woodland or Early Caddo times, while the grooved axe is probably a much older Archaic artifact. 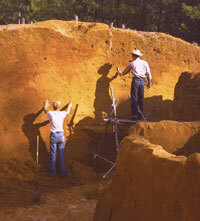 The Snipes site, like many sites in the Caddo Homeland, has a mixture of artifacts dating to different periods. TARL archives. French Fork Incised jar from a Fourche Maline context at the Crenshaw site, Miller County, Arkansas. Although this is a Coles Creek style commonly found in the lower Mississippi Valley, it was probably made locally by Fourche Maline potters. Photo by Frank Schambach. Unique four-chambered Fourche Maline pottery vessel from the Crenshaw site, Miller County, Arkansas. 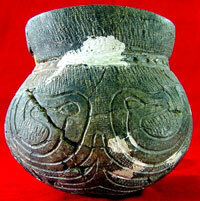 Dozens of unique pots have been found at this site that are unlike any known elsewhere. The inventiveness of the Crenshaw Fourche Maline potters anticipates that of early Caddo potters. Photo by Frank Schambach. 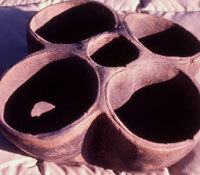 Bottom view of unique four-chambered Fourche Maline pottery vessel from the Crenshaw site, Miller County, Arkansas. Photo by Frank Schambach. 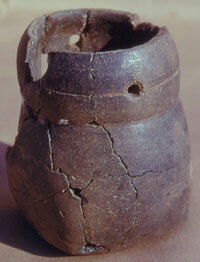 Cone-shaped sandy paste vessel from a Mossy Grove site in Polk County, Texas. Whole Mossy Grove pots are rare. TARL archives. Nutting stones and grinding slabs such as these are found in Woodland as well as Late Archaic sites in the Caddo Homeland. TARL archives. Manning Fused Glass, a volcanic material that outcrops in a narrow east-west band near the southern limit of the Caddo Homeland just north of Huntsville, Texas. This material was used by local Caddo peoples to make stone tools. It is, however, characteristically fractured, as this piece is. It is also usually found in small nodules. This example is the largest known nodule of Manning Fused Glass, measuring about a meter across (39"). Photo by Ken Brown.